*Note: This flavor was only listed in Canada last month but is now on both the U.S. and Canadian versions of the Baskin-Robbins website. We have reports that the U.S. does have it, but please call your store ahead of time to verify that they have it in stock. Right off the bat, it's an interesting visual as compared to the bland, beige, BeaverTails ice cream I reviewed here last summer. This has the distinct colors of yellow, white and dark purple and the layers are separate throughout. The smell is lemony, sweet, and makes your mouth water. I better dive in. The ice cream is cool, sweet, creamy and citrusy. 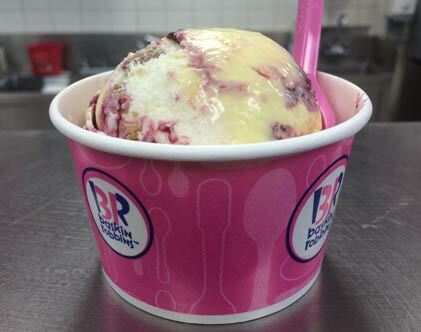 The initial flavor is a mix of raspberry cheesecake ice cream and lemon meringue yogurt. 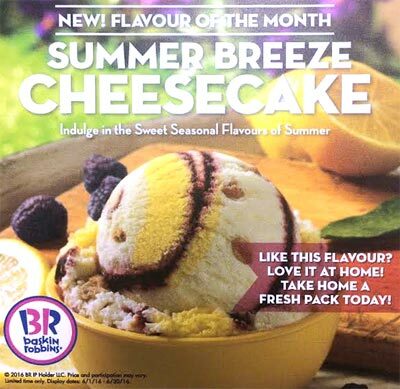 This Summer Breeze ice cream is so good, it has all the indulgence of raspberry cheesecake then just when your mouth starts to be overwhelmed by the rich creaminess, the lemon comes through and wakes up your taste buds for more. It's an adventure how your mouth bounces back and forth between the two flavors, then when you least expect it, but need it, in comes the cinnamon oatmeal chunks. These chunks are buttery, crispy and packed with cinnamon flavor. The chunks hold up to the ice cream and only very slightly give way when you bite them, like when the milk penetrates the clusters in Oatmeal Crisp cereal. It makes way for a much needed flavor and texture boost while you are eating it. 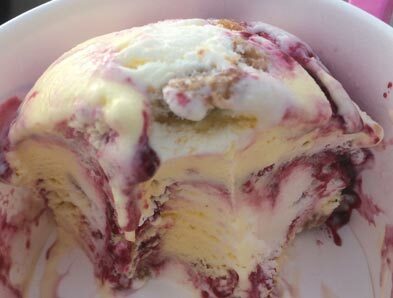 The entire ice cream is well balanced; the tart, sweet, jammy black raspberry ripple pairs with and is also a contrast to the tart, sour, creamy lemon cheesecake flavors, followed by the tender oatmeal chunks. These aren't soft oatmeal cookies chunks, but rather a oatmeal crumble you'd find on an apple crisp or a hard oatmeal cookie, reminiscent of Dad's Oatmeal cookies here in Canada. The verdict: One of the better ice creams I've tried in my life. Perfectly balanced, sweet, summery flavors. Has everything going for it. Texture, creaminess, tartness. I would definitely try this again before it's gone. I'm glad I was asked to review this or else I probably wouldn't have tried it, but I am very pleasantly surprised. They also advertised a Summer Breeze milkshake, but I'm not sure you would get the full effects of this awesome ice cream with the added milk and lack of texture from the oatmeal. But great job to the Baskin Robbins development team, keep 'em coming. That sounds so good! I do hope they carry it in the U.S. Apparently it is being sold in the US - but it's an optional flavor. Each franchise gets to decide if it wants to carry it. My closest BR doesn't have it, but the second closest does. It's a wonderful flavor. One of the better BR flavors I have had. I'll definitely be going back for more!! !